Wellington, FL - January 13, 2012 - Week one of the 2012 FTI Consulting Winter Equestrian Festival (FTI WEF) continued at the Palm Beach International Equestrian Center (PBIEC) in Wellington, FL, today with more exceptional hunter competition. Showing in the Eugene R. Mische Grand Hunter Ring, the Horseware Products Adult Amateur Hunter 3'3" division presented championship honors. Twenty-three-year-old Allyson Blais, of Delray Beach, FL, guided her nine-year-old Warmblood gelding Camden Yards to the championship tricolor with 38 totals points to top the division. 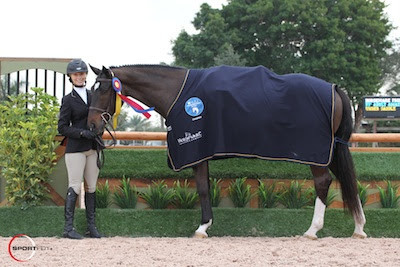 Horseware Products is the Official Horse Blanket/Clothing of the FTI WEF. The first week of the FTI WEF runs through Sunday, January 15, and is sponsored by Surpass. 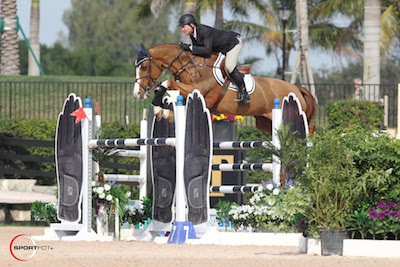 The 2012 FTI Winter Equestrian Festival has 12 weeks of competition that conclude on April 1, 2012, and they will be awarding more than $6 million in prize money through the circuit. The highlight jumper class in week one is the $30,000 Surpass Grand Prix on Saturday, January 14, at 7 p.m.
Blais and Camden Yards won both classes over fences on Thursday and returned to place first and third over fences and third under saddle today. The reserve championship was awarded to Margaret O'Meara and Coin Toss, owned by Woodland Way, Inc. The pair placed second, fifth, second and fourth over fences and also finished second under saddle for a total of 21 points. Blais rides in Wellington year-round and trains with Alan Korotkin at Castlewood Farm. She has owned Camden Yards for about two years. "He has been awesome," she smiled. "He is not the easiest horse to ride. He can be a little quirky sometimes, but he tries so hard and he jumps unreal." The rider joked that she calls Camden Yards 'Beavis' or 'Butthead' in the barn, depending on his mood that day. "He has a lot of personality; he is really funny," she said. "He comes out and it has to be his way, but he is a really good boy." Watch Allyson and Camden Yards in a winning round! Blais explained that she usually shows Camden Yards in the Amateur-Owner Hunters, but just started a new job and has not had a lot of time to ride. "This division just happened to work in with my schedule," she stated. "Yesterday I showed and then went right to work." When Blais is too busy to show, rider Shawn Casady steps in to compete Camden Yards in the Junior Hunters. The gelding is for sale, so Blais hopes to keep him showing throughout circuit to focus on finding him a great new owner. Even though Blais shows in Wellington all year, she admits that it is very different showing at the PBIEC once the FTI WEF circuit begins. "Sometimes I get a little nervous. I call it 'WEFitis,' but I think that since I show here all the time it calms my nerves a little bit. It is so exciting to see everything finished and to have all of the rings going and all of the people here. I have to step up my game once everyone else gets here. No more slacking and no more chipping," she laughed. 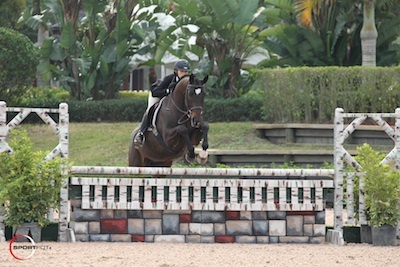 Hunter competition at the 2012 FTI Consulting Winter Equestrian Festival will continue on Saturday when the Marley Goodman Small Junior Hunter 16-17 division will conclude its classes and present championship honors for week one. For full results, please visit www.showgroundslive.com. McLain Ward (USA) made it two wins in a row today, this time with Louisburg Farm's Esplanade 7 in the $6,000 Spy Coast Farm 1.40m Jumpers. He guided Esplanade 7 to victory in a jump-off time of 38.883 seconds over 60 other entries in the class. Second place went to Darragh Kenny (IRL) on Obelix, owned by Missy Clark and North Run, who finished in 40.464 seconds. Hillary Dobbs (USA) and The Dobbs Group's Udento VDL were third in 40.516 seconds. "I was thrilled with her. She's coming back off an injury and she was out for a year," Ward said. "They (Louisburg Farm) did a beautiful job rehabbing her. We cruised around on Wednesday and today opened her up a little bit. She's a very fast horse, it's not like you really have to put the pedal to the metal, and she's experienced. But she felt really good. It's nice to start her circuit off with a win, and we hope she can win a lot of other classes this year." Although they went early in the class, Ward felt confident going into the immediate jump-off. "I know her well and where she can make up time. She can turn quite tight. She's just a very efficient horse. I didn't feel like I had to press her hard anywhere. It was just kind of neat. You know what to expect with her," he said. Hillary Dobbs has returned to her winning ways as she and Marengo, owned by The Dobbs Group, took the top prize in the $6,000 Spy Coast Farm 1.40m Speed Challenge. Dobbs and the well-known speedster Marengo took the win in 60.343 seconds over Nicolas Paillot and Olympic de Chamant, who finished in 62.428 seconds. Luis Larrazabal (VEN) and G&C Lepanto were third. Earlier in the day, the $1,500 Griffis Group High Junior Jumper class was held. Sydney Shulman and Fit 3 took first place. In the $2,500 High Amateur-Owner Jumpers, Samantha Senft and Early Morning finished in the top spot. The winner of the $1,500 Adequan 7 Year Old Young Jumper qualifier was Ammy V, ridden by Marilyn Little-Meredith. Laura Chapot and Zealous won the $1,500 Adequan 8 Year Old Young Jumper qualifier. The FTI Consulting Winter Equestrian Festival will continue tomorrow with a full schedule of hunter and jumper competition. The highlight class of the week, the $30,000 Surpass Grand Prix, will start at 7 p.m.
For full results please visit www.showgroundslive.com. Photo Credit: Alyson Blais and Camden Yards, McLain Ward and Esplanade 7 at the 2012 FTI Consulting Winter Equestrian Festival. Photo © Sportfot, Official Sport Photographer of the FTI Winter Equestrian Festival, www.sportfot.com. This photo may be used only in relation to this press release.